Global and cultural competencies comprise the knowledge and skills individuals need to be successful in today’s interconnected world and to fully engage in and act on issues of global significance. Our students need to be equipped with critical thinking, communications, socioemotional and language skills in order to work effectively with their counterparts in the United States and around the world. Understanding and appreciating our diverse country and other parts of the world, including different religions, cultures and points of view, are essential elements of global and cultural competence. People who are globally and culturally competent are proficient in at least two languages; aware of the differences that exist between cultures; critical and creative thinkers, who can understand diverse perspectives; and able to operate at a professional level in intercultural and international contexts. These competencies are not isolated skills, but rather interrelated skills and areas of knowledge that are used together to enable individuals to understand the world and take action. To guide students on how to develop global and cultural competencies over time, the Department created the following Framework for Developing Global and Cultural Competencies to Advance Equity, Excellence and Economic Competitiveness. 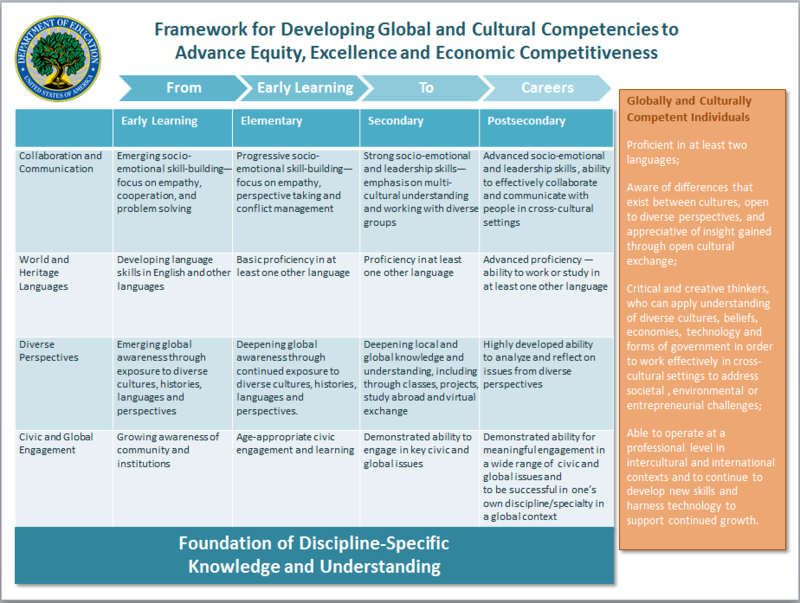 This framework is the product of a working group with representatives from across the Department and discussions with the education community, building on existing research and providing a structure for the development of global and cultural competencies beginning in early childhood through postsecondary education. All of it is based on a foundation of discipline-specific knowledge. For many years, the Department has supported programs designed to increase expertise in world languages and area and international studies through the Department’s Office of International and Foreign Language Education (IFLE). Currently, IFLE administers approximately $72.0 million for domestic international education programs authorized under Title VI of the Higher Education Act and overseas international education programs authorized under the Fulbright-Hays Act. Collectively, these programs provide U.S. students, teachers, researchers and administrators with unique opportunities to gain proficiency in world languages and expertise about the regions where these languages are used, in preparation to meet our nation’s ongoing global needs. Consistent with the Framework’s interrelated content-based knowledge and competencies, IFLE programs are intentionally interrelated and complementary in their purposes, including training a globally competent workforce able to engage with a multilingual and/or multicultural clientele at home and abroad; increasing teaching and research expertise on international business and global issues; and expanding access to international education and training, especially for traditionally underserved students. The Framework also supports IFLE’s program administration and monitoring initiatives, assisting the Department in gauging program relevance and the extent to which these programs are providing meaningful and productive academic and career opportunities. Program recipients not only need to acquire relevant global skills, but they also must have opportunities to put those skills into practice. To that end, IFLE has established competitive priorities for its Title VI and Fulbright-Hays grant competitions that encourage meaningful and sustained professional development and collaboration with minority-serving institutions and/or community colleges; the development and dissemination of language-learning materials for the K-16 education community; and work-based experiences, such as internships for international business students. Return to International Strategy. Go to Objective 2, Objective 3.